Larry Harpe was more than just some boy sitting across from me in Coach Pisarich’s 1984 junior high civics class. With his razor-sharp quips, fearless antics, feathery strawberry hair, upturned Polo collar, tight jeans, and Converse high tops…Larry was, to me, the epitome of effortless cool. Memories of his good looks and brash humor have drifted in and out of the transoms of my mind since our one year as classmates at Nichols Junior High School before his family moved from Mississippi to Illinois in the mid ’80s. But he has always stayed with me, a red-headed piece of lore from my childhood of a larger-than-life character who has grown to represent the potential and exuberance of living. Okay, I realize that’s a lot to place on the shoulders of a seventh grader. But Larry, as it turns out, has pretty much lived up to the lore. Though to ask him, his expectations in junior high were much different. I reconnected with Larry on Facebook not long ago and was completely not surprised to learn that he spends his days now, not breakdancing, but working as a freelance rock-climbing guide in the desert of Moab, Utah. As a kid, Larry was always climbing—door jambs, trees, buildings—but his higher aspirations wouldn’t be fully met until much later and after a good deal of searching. While his family’s move to Illinois meant I would forever think of Larry as the coolest seventh grader ever, the reality of that move was much less glamorous for the actual junior high kid who left behind popularity to live a new life where he was the new student in a new school in a new city in a new state. Troubled and restless, he made it to 10th grade before the vice principal of his southern Illinois high school asked him to leave. So, Larry accepted the invitation and dropped out. He eventually earned his GED and enrolled in community college to study history. But despite almost earning his associate’s degree, Larry was still unhappy and made a rather unorthodox decision. He would leave school, leave Illinois, move to Portland, and, with no job and no experience beyond climbing door jambs, trees, and buildings, Larry would…climb mountains. But he soon realized that it was climbing itself, not conquering mountains, that was his true goal. He became intrigued with the objective danger of spending hours climbing rocks and sheer cliff faces with 1,000-foot vertical walls. These climbs challenged him both physically and mentally, requiring balance and technique that he parallels with gymnastics and dance. “It’s a fine line between performance and strength,” he says. In 1997, Larry, then 28, fell in love with Moab when he and a friend took a detour through Utah on a trip from Oregon to Colorado. The place haunted him so much that, when his father passed away of lung cancer in 2000, Larry responded by moving to Moab to take a job as a climbing guide. “I bought an old truck and packed everything in it, and I ended up in Moab,” he says. And the wandering climber who searched the continent for direction has been guiding others since then. There is nothing typical about Larry’s work or schedule. Deeming himself a guide who “works under the radar,” Larry freelances his services to clients from around the country and around the world. These clients, who find him solely through word of mouth, range from individuals who want to experience a climbing adventure to film crews who need his assist on high-angle safety riggings, like the crew who shot the iconic 2011 Citibank commercial featuring a young woman climbing a very precarious desert tower. During the winter—his off-season—Larry usually leaves Moab to find odd jobs that come available, like his current gig of busing tables. A lot more than odd jobs have fallen into Larry’s lap. This off-season busboy not only works with film crews but has been featured online by both Smithsonian Magazine and The New York Times, and the attention seems to baffle him. Larry naps on a nine-day climb up California’s El Capitan. Larry’s path has taken him on climbs in Washington state, Colorado, Oregon, California, Idaho, Utah, and Arizona. And this drive is what makes El Capitan in Yosemite National Park in California and Black Canyon in Colorado his favorite climbs. Both require days of work and involve extreme concentration in extreme conditions, like having to sleep while suspended from the side of the mountain. But it’s not necessarily the size of the rock that draws Larry to a climb; it’s the technical prowess it takes to make a climb and the reward of being able to look out from a summit to see what he’s conquered, which is why he never tires of his desert climbs. 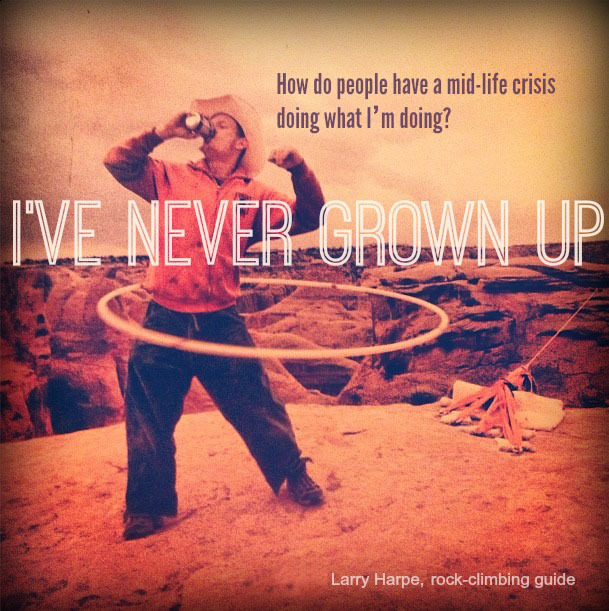 At 45, Larry doesn’t climb as much as he did when he was in his 20s. He’s found that he’s just as content now to simply spend time with his 10-year-old Blue Heeler/Belgian Shepherd (Malinois) mix, Slack. But despite the creep of time and the realities of getting older for both him and Slack, this Peter Pan rock-climbing guide is not ready to hang up his ropes and harnesses yet. Not that he begrudges anyone choosing to live life 9 to 5; Larry knows his type of living isn’t for everyone. I’ve said it before, and I’ll say it again. Effortless and cool. Hey Shelley… I went to Jr High @ the same time as you & Larry. Your name sounds familiar. Do you remember me?